The other day I was looking for an old photo and ran across this one, circa April 2009. 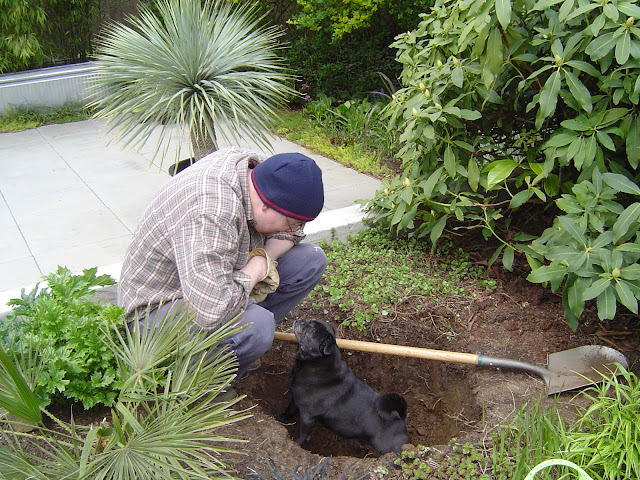 Sammy (our big Yucca rostrata) was finally getting planted — but before that could happen Lila needed to try on the hole for size. People ask all the time about Sammy's age. We don't know how old he was when we bought him. But here's what he looked like last summer, eight years and five months after the photo above was taken. Weather Diary, March 27: Hi 57, Low 47/ Precip .05"
OMG! Lila is so adorable! And not gray. What a sweet photo. "Why are you playing with dirt when you could be petting me?" That photo is too cute! That could be the caption of the poor girl's life here. Lila's picture made my day! Sammy has grown nicely in the last eight years. Sammy has grown into a handsome dude. The bed he is in looks so full and rich. Lila is a darling too. How'd you come up with "Sammy" as a name for your yucca? It just came out of my mouth one day, I really have no idea why! Lila didn't help dig the hole? She looks like she owned it! Sammy is a handsome devil. She's a lover, not a digger. But of course she had to check out the hole first... that goes without saying! So, how do you know Sammy is a 'he'? Speaking of the wording chosen for titles, this one had me worried for a minute! Yikes! I didn't even catch that, and my head has been there a lot lately as she's not been doing well and we've been having to think about what we'll do when the end is here.